Have you been pinched today? Did you remember to wear green? Even though I am not Irish(that I know of), if you didn’t wear green on St. Patrick’s Day then you get pinched! I honestly don’t know a lot about the holiday and why it is celebrated all over the world, but I love the fun and whimsy of the holiday. Rainbows, pots of gold, green everything, and hoping you find that lucky 4 leaf clover. 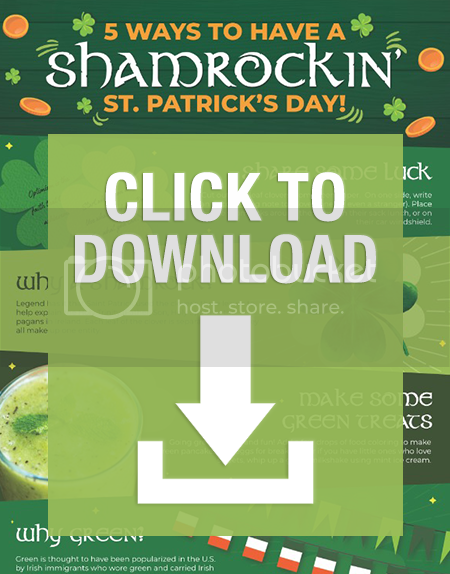 I want to share some ways that you can celebrate the green for St. Patrick’s Day. I love making fun decor that I paint myself for each holiday and recently painted this shamrock a pretty shade of green with gold accents. After all we are all on a search for that pot of gold whether it be real money or lasting friendships or whatever way you would like to be rich in life. Some other ways we celebrate the holiday is by coloring our food and drinks green. When you have kids, it is a fun way to bring the spirit of the holiday in. Did you know that St. Patrick’s Day is celebrating the life of Saint Patrick who was the foremost patron saint of Ireland. He was the one who helped introduce Christianity to Ireland so they use the day of his death to celebrate what he brought to their country. It has become a global celebration of Irish culture. Did you know that the tradition of wearing green was to make people “invisible” to mischievous leprechauns who would go around pinching people.. or so they say! Here are a few more ways that you can celebrate the holiday with some ideas from Catholic Central. Catholic Central wants to put you in the Irish spirit by gifting one of you with a bamboo cheese board where you can do a fun tasting of Irish cheeses with a good soda bread or other Irish delicacies. To enter, leave a comment telling me one of your favorite memories or traditions that you celebrate on St. Patrick’s Day. Celebrate the Green year round! Must be 18 or older to enter. Giveaway will end 3/29. I will contact the winner by email. You have questions about the Catholic faith and what it means to be Catholic. We have answers. Using a team of witty writers, appealing hosts, and even some learned theologians, we’ve created shareable videos that teach the timeless truths and deep history of the Church with humor and heart. Produced in the Family Theater Productions studios on Sunset Boulevard in Hollywood, CATHOLIC CENTRAL entertains, enlightens and inspires. Beautiful board. Lol. I did not know that the green was to make one invisible!